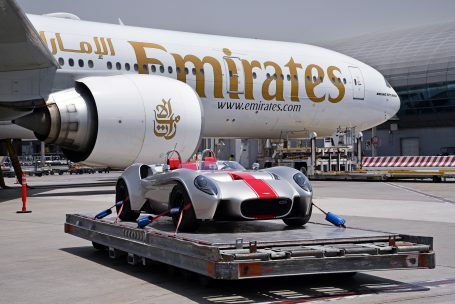 Emirates SkyCargo, the freight division of Emirates, transported the first car designed and built entirely in the U.A.E. to France where it will be exhibited during the prestigious ‘24 hours of Le Mans’ endurance race. Design-1 is a sports car designed and built entirely in the U.A.E. by Jannarelly Automotive with Equation Composites LLC – the first company to have acquired a car manufacturing license in the country. Inspired by the classic sports cars of the 1960s, the Jannarelly Design-1 is a lightweight retro-futuristic car built using hi-tech composite materials. Equation Composites uses a small team of specialists to build each car, valued anywhere between US$70,000 and US$90,000, allowing for a high degree of customisation according to the specific requirements of customers. Emirates SkyCargo worked with Prodex Worldwide, a specialist freight forwarding company providing specialist transport, logistics and warehousing services across a number of domains including the aerospace and automotive industry, to transport the Jannarelly Design-1 from Dubai to Lyon. Emirates SkyCargo offers a specialised transportation solution – Emirates SkyWheels – to transport high value and premium automobiles. Watch the video of the Jannarelly Design-1 being loaded for its flight from Dubai to Lyon. Emirates SkyCargo regularly transports high value premium and luxury automobiles on both its passenger aircraft and freighters across its global network of over 155 destinations. The transportation of these vehicles is managed by experienced staff who are specifically trained on loading and unloading vehicles from aircraft with utmost attention to care and safety. Emirates SkyCargo works with leading car manufacturers as well as car collectors to facilitate movement of cars across continents. Recently the air cargo carrier provided a bespoke Emirates SkyWheels solution to Jaguar Land Rover in order to transport cars from the UK to Chicago for testing. In November 2016, Emirates SkyCargo was one of the sponsors of the inaugural Gulf Concours car competition and brought in many rare classic and modern bespoke luxury supercars to Dubai from across the world. Emirates SkyCargo operates a modern all-wide body fleet of 258 aircraft including 15 freighters- 13 Boeing 777Fs and two B747-400ERFs and features state of the art facilities at its cargo hubs at Dubai International Airport and Dubai World Central.